Five 6 inch strands. Czech glass One Cut seed beads in PURPLE PICASSO color, size 10/0. Each strand contains approximately 100 beads and you will receive 5 looped strands. These beads are called "1 cuts" and I believe they are the same as a Charlotte. 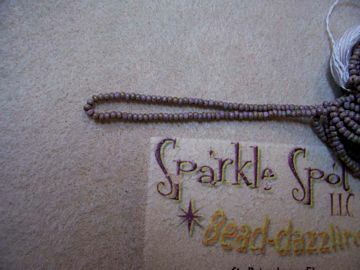 Charlotte beads are seed beads that have one flat surface cut into them. The flat surface reflects light better than the curved surface providing a bit of extra sparkle to the piece of jewelry.